And on we roll with the rest of the tut! Re-enable the Snap to Grid (View > Snap to Grid). For the following step you will need a grid every 0.5px. So, go to Edit > Preferences > Guides & Grid and enter 0.5 in the Gridline every box. Pick the Rectangle Tool(M), create a 136 by 5px shape, and fill it with a random color. Then go to Effect > Stylize > Rounded Corners. 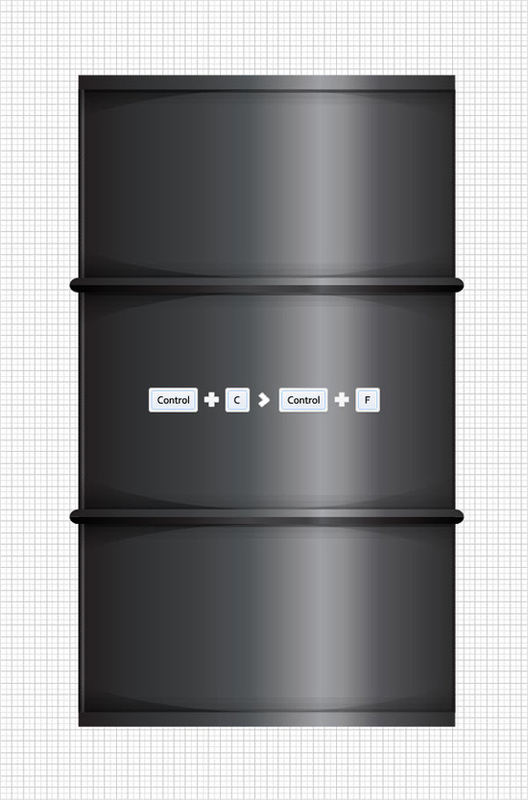 Enter a 3px radius, click OK and go to Object > Expand Appearance. Grab the Pen Tool(P), draw a simple horizontal path and place it as shown in the following image. Make sure that it cuts the rounded rectangle created in the previous step in half. Once again, the Snap to Grid should ease your work. 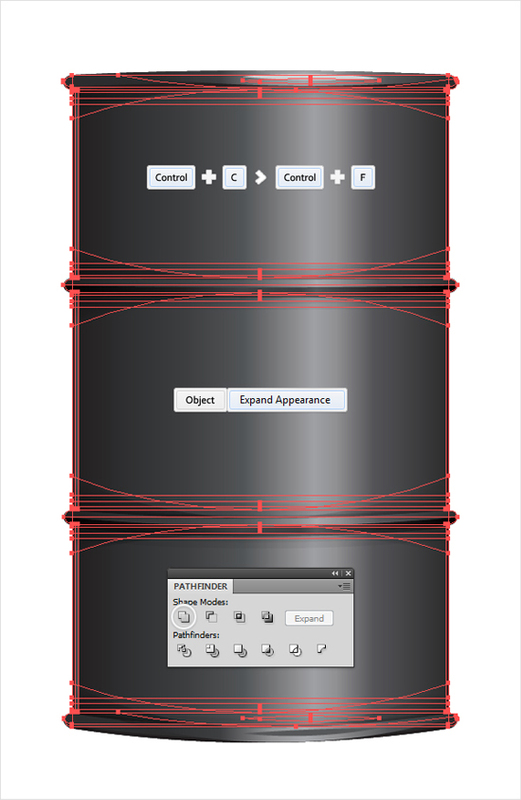 Select this horizontal path along with the rounded rectangle created in the previous step and click on the Divide button from the Pathfinder panel. 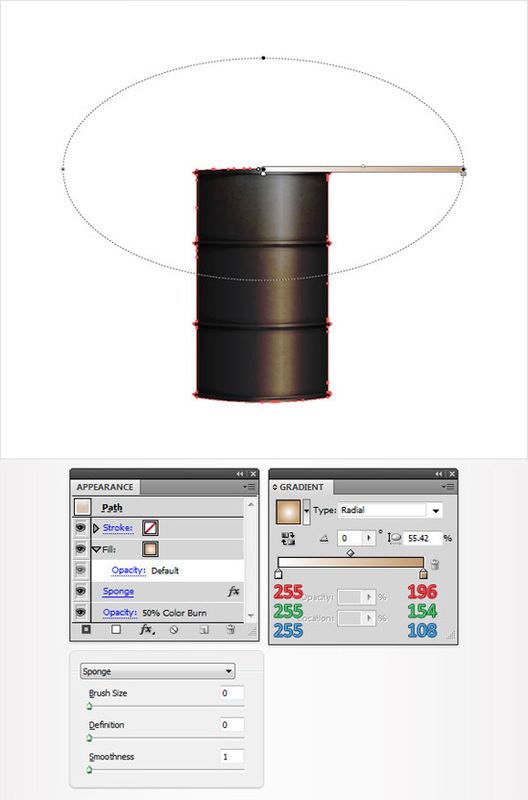 Move to the Layers panel and you will find a new group with two simple shapes. Open the group created in the previous step, select the top shape and fill it with the linear gradient shown in the first image. 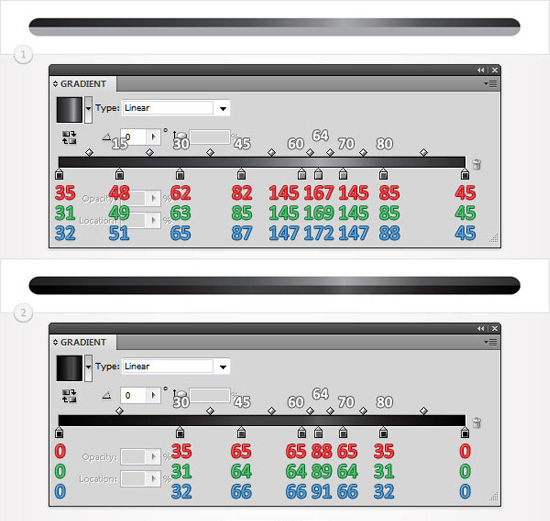 Move to the bottom shape, select it and fill it with the linear gradient shown in the second image. For the following step you will need a grid every 1px. So once again, go to Edit > Preferences > Guides & Grid and enter 1 in the Gridline every box. Reselect the group edited in the previous step, duplicate it (Control + C > Control + F) then place these two groups as shown in the following image. Pick the Rectangle Tool and create a new 136 by 5px shape. 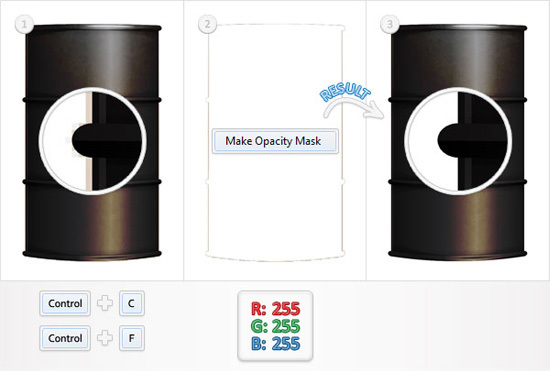 Fill it with R=45 G=45 B=46, place it as shown in the first image and go to Effect > Stylize > Rounded Corners. Enter a 3px radius, click OK and go to Object > Expand Appearance. Select the resulting shape and make two copies in front (Control + C > Control + F > Control + F). Select the top copy and move it 1px up. Reselect both copies and click on the Minus Front button from the Pathfinder panel. Fill the resulting shape with R=35 G=31 B=32. 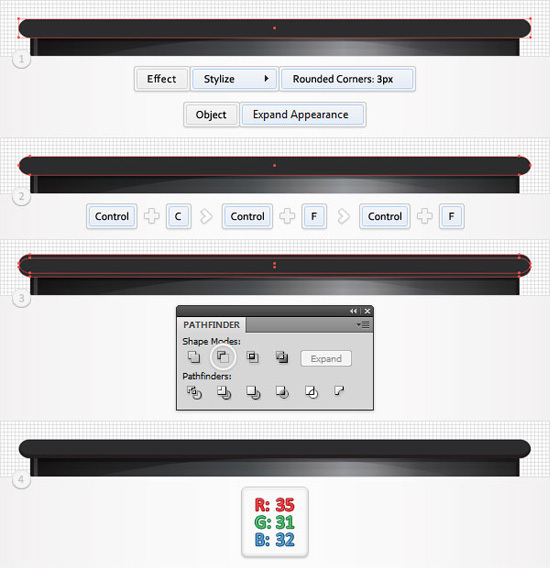 Reselect the rounded rectangle created in the previous step and make a copy in front (Control + C > Control + F). 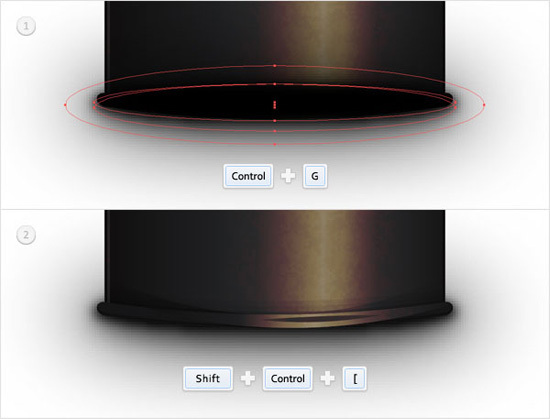 Pick the Ellipse Tool(L), create a 165 by 30px shape and place it as shown in the second image. 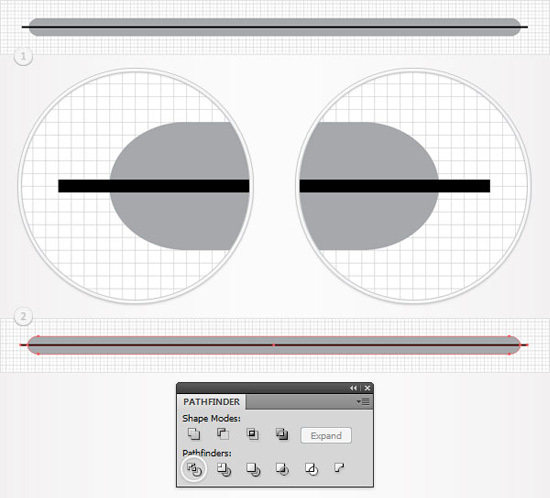 Select this circle along with the copy of the rounded rectangle and click on the Intersect button from the Pathfinder panel. Fill the resulting shape with the linear gradient shown in the final image. Pick the Ellipse Tool(L), create a 47 by 2px shape, fill it with R=209 G=211 B=212 and place it as shown in the following image. Focus on this squeezed circle, pick the Convert Anchor Point Tool (Shift + C) and click on the left and right anchor points. This should add a bit of sharpness to your shape. Select all the shapes created in the last three steps and group them (Control + G). Make a copy of this group (Control + C > Control + F) and drag it down as shown in the second image. Open this new group, select the sharp shape and fill it with R=88 G=89 B=91. Select all the shapes created so far and group them (Control + G). Select this new group and go to Effect > Warp > Arc Lower. Enter the data shown below, click OK and go to Effect > Warp > Arc Upper. Again, enter the data shown below and click OK.
Reselect the group created in the previous step and make a copy in front (Control + C > Control + F). Select this new group, go to Object > Expand Appearance and click on the Unite button from the Pathfinder panel. Select the shape created in the previous step and fill it with the linear gradient shown below. Lower its opacity to 50%, change the blending mode to Color Burn and go to Effect > Artistic > Sponge. Enter the data shown below and click OK.
Take a closer look at the shape edited in the previous step and you’ll notice that the edges are a bit pixelated. We’ll use an opacity mask to fix this. First, open the Transparency panel. Next, select the shape created in the previous step and make a copy in front (Control + C > Control + F). Select this copy and hit the D key on your keyboard. This will add the default properties (white fill and black stroke) for your shape. Remove the color from the stroke then select the white shape along with the shape created in the previous step, open the fly-out menu of the Transparency panel and click on Make Opacity Mask. Now take another look at your masked shape and the pixelated edges should be gone. 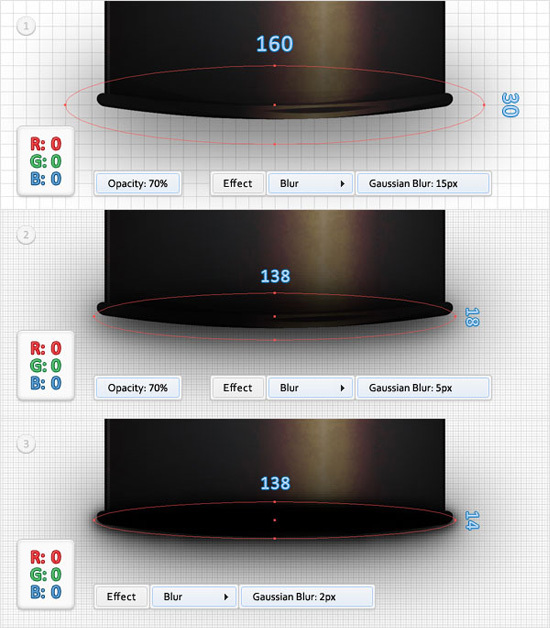 Pick the Ellipse Tool(L), create a 160 by 30px shape and place it as shown in the first image. Fill it with black, lower its opacity to 70% and go to Effect > Blur > Gaussian Blur. 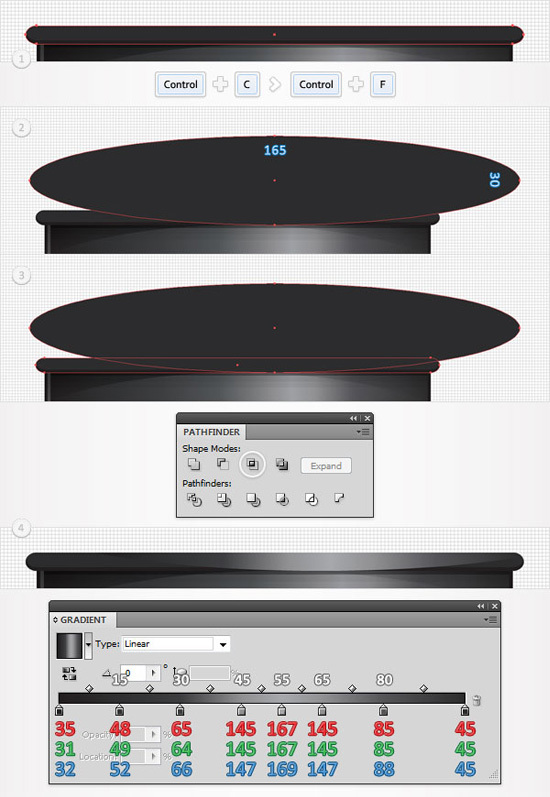 Enter a 15px radius and click OK. Continue with the Ellipse Tool(L), create a 138 by 18px shape and place it as shown in the second image. Again, fill it with black, lower its opacity to 70% and go to Effect > Blur > Gaussian Blur. Enter a 5px radius and click OK. 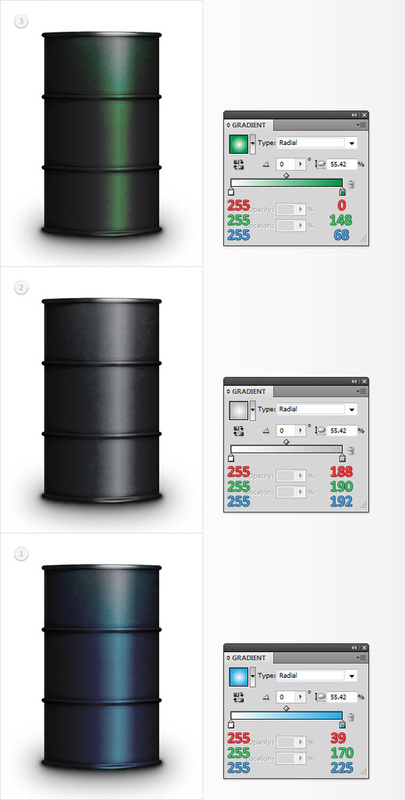 Finally, create a 138 by 14px shape and place it as shown in the third image. Once again, fill it with black and go to Effect > Blur > Gaussian Blur. Enter a 3px radius and click OK.
Reselect the three shapes created in the previous step, group them (Control + G) and send the group to the back (Shift + Control + [ ). 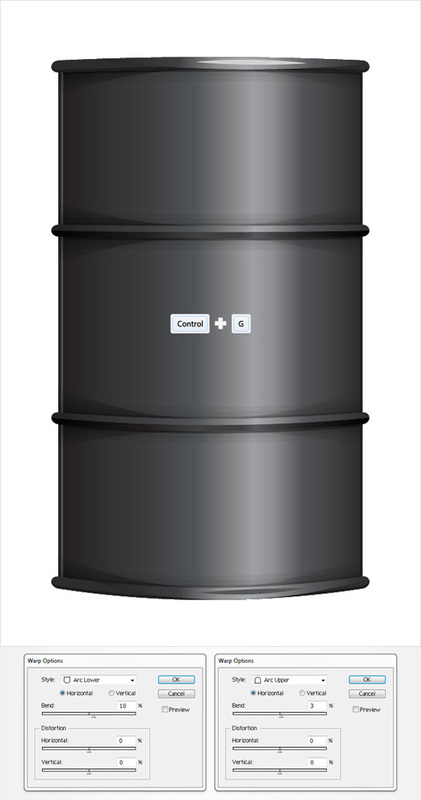 Finally, you can use a different color for your oil barrel. Just edit the gradient used for the masked shape to better suit your tastes. 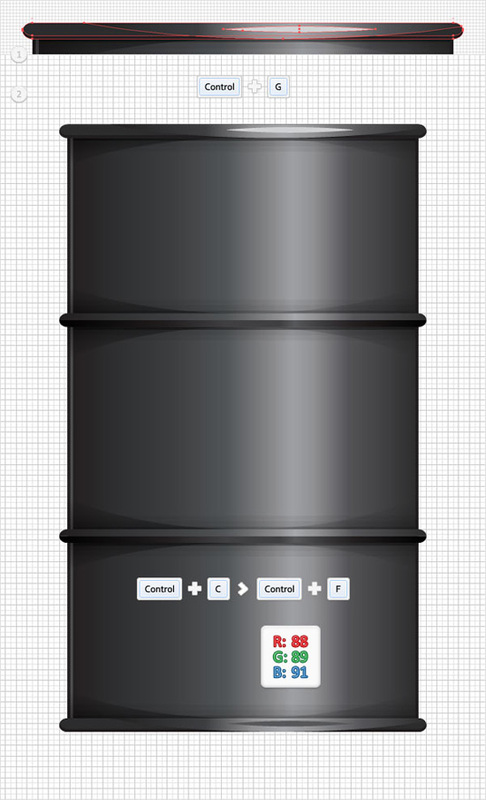 Below is another look at the final product you should be left with now that we have finally reached the end of this all new Adobe Illustrator tutorial. But things aren’t quite done yet. Now it’s time for feedback. So please take a second and let us know what you thought about this tut in the comment section.